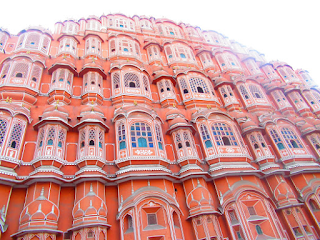 Desperately Seeking Adventure: Jaipur, India: Rajasthan's Pink City! 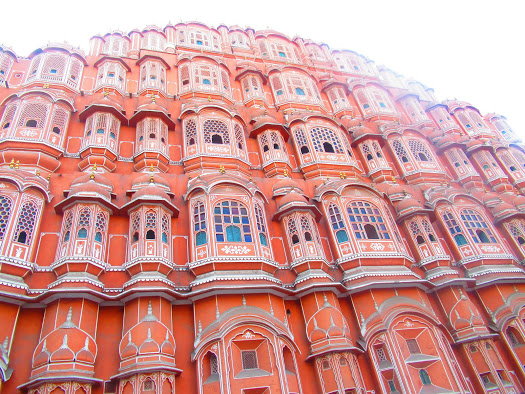 Jaipur, India: Rajasthan's Pink City! After five hours on the road it was such a relief to reach the Indian Province of Rajasthan, home to its provincial city of Jaipur. Hailed as the 'Pink City,' I was on the last leg of my Golden Triangle tour. My driver had mentioned that Jaipur would offer some great shopping for handicrafts, oh I had my money at the ready to buy some cultural items for my Montessori materials. The first place that I saw in Jaipur was the Jal Mahal, half-submerged in the Man Sagar Lake I secured my first glimpse of a very different palace. If truth be told I wasn't completely listening to the tour guide, the bizarreness in-front of me didn't need any backstory, out of the five stories a staggering four stay underneath water when the lake is at its fullest. 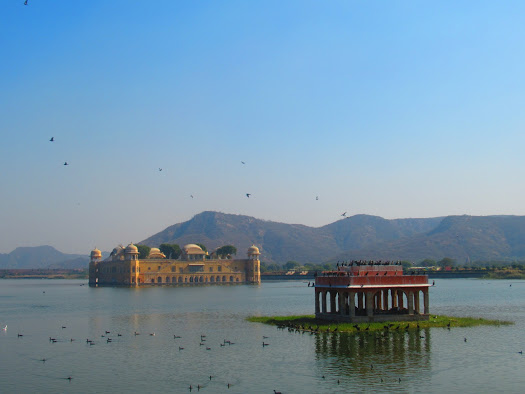 The views over to the mountains, across Man Sagar Lake with the Jal Mahal in view sure gave me something to remember. Lined along the riverside walkway I saw many sellers, I couldn't help but buy everything in sight, from bangles to cute elephant embossed pencil-like cases. I had my upcoming language materials in mind and a good teaching friend of mine was considered for some gifts that we would both benefit from with our Montessori endeavours. With the Jal Mahal in the middle of a lake in the distance and my arms full of Jaipur made handicrafts, it was a time! I was seriously looking for the 'pink' that gave Jaipur its name! Don't ever pester me, I had to dish some realness to the over-enthusiastic sellers at the riverside opposite the Jal Mahal. They wanted to make their coins but I stressed I wouldn't look at their stalls if they pestered me, it was simple as 1, 2, 3! Heading to a garment, ornament and jewellery showroom with much reluctance, I learnt about the unchanged art of printing cotton fabric with elaborate cultural patterns, I tried my own hand to emboss some fabric with an elephant stencil. Buying a lovely pink pashmina for the girls in my class, I half had one of my fellow foreign teaching friends in mind for that beauty. I tried on some sari fabric, secretly I wanted it but let's be real I'm not going to be making any wardrobe decisions like that in China! Jaipur, thanks but no thanks! I bought myself some semi-precious earrings because apart from holidays I don't treat myself ever! It was pushing on for lunch time, I wanted some food! Situated in the heart of Jaipur's bustling centre, City Palace stood with its signature Jaipur 'pink' peach colouring and it looked gorgeous in the mid afternoon sun. I paid my entrance fee, entered without fuss to find simple directions that led me to the Chandra Mahal building, it had been the residence to the royal family of the time, what time period that was I didn't pay attention to that nugget of information, the stunning architecture and colour was the only knowledge I needed. 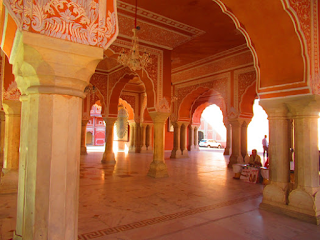 Captured to the right stands the Diwan-I-Khas, I was amazed by the rich blend of pink peachy tones that mixed so well with the intricate details present that were adorned in brilliant white. I stood still with amazement, the whole palace complex transported me to another world, the fact I had reached to Jaipur in real-time was just something else! Jaipur presented itself well, it stood as a truly beautiful city from where I was standing. Yes, JP! Venturing further into the Chandra Mall at Jaipur's City Palace allowed me to marvel at the rich displays within the Diwan-I-Am, exhibits and photos ranged from the times of the Maharaja and the Viceroy's hailing in India during the times of the British Raj. 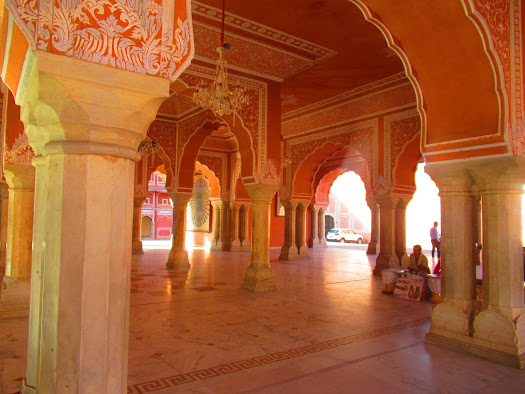 I saw a slice of many histories in one instance, keeping things at my own pace I didn't pay the tour groups any mind, soaking the culture up it was time to meet up with the tour guide before going to the Hawa Mahal. I was honestly beginning to get so confused with all the 'Mahal's' I had seen during my Golden Triangle tour! Throwing my money in all directions I bought a lovely Indian drum, I knew somewhere in my English Corner it would come in handy, aside from that purchase I was intoxicated by the vibe Jaipur possessed, it was nothing like the Delhi and that was just fine! The day was pressing onwards, Jaipur's colourful streets kept on giving me life, it wasn't going to be over yet! My third Indian City stayed! Life in India for women is now slowly changing but during the time Jaipur's Hawa Mahal housed the royal Indian princesses it was another story, a story a million light years away from the likes of 2018. Translated from Hindi to 'Palace of Winds' the palace was engineered to give the palace-bound princesses a comfortable breeze during those scorching summer months, it was a lot to make sense that the princesses weren't allowed out of the palace walls. Nevertheless, I just adored the pink and red shades being served to me during that December afternoon. I was seeking the famous photo that depicts all of those windows, I waited patiently for that photo opportunity. Climbing some steep stone steps took some going, there was only seven or so but with no bannister and a towering view of the city in the next glance it was a tender few steps till I found the handrail! That view was sensational, those steps were alright! Sensational, yes! The view from the top of the Hawa Mahal gave me a Birdseye view of Jaipur's cityscape. I took all the views in, the landscape looked like some Arabian fairytale, the rooftops and mountains gave me everything that I needed from the view! After making my way back down to street level it was time to capture the one and only worthy photo of Jaipur's Hawa Mahal, well from my opinion anyway. Dodging the traffic had to be done but in actual fact I snatched a better photo directly underneath those famous windows. Checking into the hotel felt good, it had been such a busy two days with all the hours on the road and the different environments. The following day would bring the final drive back to Delhi before my Ganges day trip on the 19th of December 2018. Missing breakfast yet again during that trip because of the hotel I'll always state that breakfast is so important! Anyway, Jaipur gave me everything from its 'Pink City' palaces in Northern India's Rajasthan. 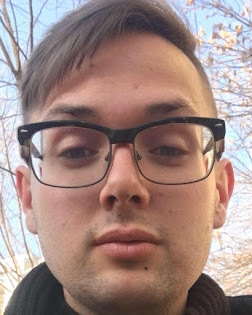 Yes, JP! Flying High... China Southern Airlines! On The Borderline... Dandong, China!